Heat the milk.Let it reduce and condense. 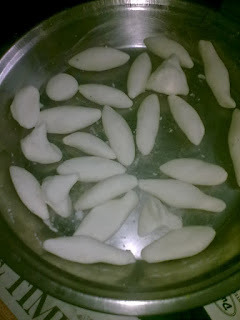 Make a dough of the rice flour with water. Prepare small balls out of the rice flour. Stuff in the freshly grated coconut in these balls to form dumplings just like how we make stuffed parathas. 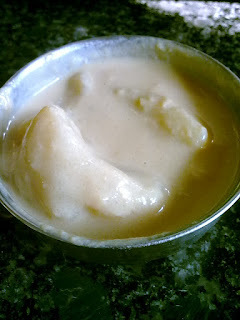 Now add jaggery in the milk for sweetness.If required add little sugar also.The sweetness can be varied as per your choice. Now put the dumplings in the milk and let it cook for about 5-10 min.